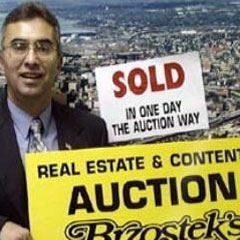 Brzostek's Auction Service, Inc. & Brzostek's Real Estate Auction Co., Inc. Welcome Brzostek's Auction Service Inc. & Brzostek's Real Estate Auction Co., Inc. are nationally recognized, award winning auction services with extensive experience in the sale of personal property & real estate in New York State. We at Brzostek's provide you with a full listing of all of our upcoming auctions and provide you the opportunity to sell your property or merchandise at auction. Recent Testimonial "Bernie, I personally cannot thank you and your exceptional staff enough for the friendly and professional support. You make a difficult situation seem effortless. Sadly, the first buyer failed to close. the well-oiled Brzostek Auction machine fired back with a greater sale. A testament to the dedication of an experienced and well organized business service. Thanks to you and your entire staff. Sincerely, Terry P. Graves "